Still on my healthy dieting, I found this Creamy Broccoli Salad which is a mayo free healthy version of the traditional broccoli salad. Broccoli and other cruciferous vegetables such as cauliflower, cabbage and kale are famous for their anti-cancer properties. Broccoli contains phytonutrients that deactivate estrogen metabolites that promote tumor growth and they prevent cancerous cells from moving to other parts of the body. Broccoli has a sulfur compound that boosts liver detox and moves potentially cancerous substances out of the body more quickly. On top of all the cancer fighting properties, broccoli has a lot of calcium which builds strong bones and antioxidants that specifically protect the eyes. I like to soak the onions in water before adding them to the Creamy Broccoli Salad to remove the harsh bite of the onions while maintaining the flavor. When you are cooking the broccoli, be careful not to overcook it because it will become limp and it will lose 50% of its nutrients. If you are serving the Creamy Broccoli Salad immediately, place the broccoli in the serving bowl. If you are serving the salad cold, place the broccoli in an ice bath to stop the cooking. The sauce for my Creamy Broccoli Salad should be quite thick, but if it is too thick you can add water 1 tsp at a time until you reach the desired consistency. Thinly slice the red onion and place in a bowl of water to soak until the rest of the salad is ready, this will neutralize the astringent flavor. Cook the broccoli in a steamer basket by gently steaming it over boiling water for 5 minutes or until just tender. Once the broccoli is cooked, submerge it in an ice bath to stop the cooking if you are not serving immediately. To make the sauce, place the garlic in a food processor and pulse until minced. Add the tahini, nutritional yeast, paprika, mustard powder, turmeric, salt and pepper, apple cider vinegar and oil then pulse until silky smooth. The sauce should be quite thick, but if it is too thick add water 1 tsp at a time until you reach desired consistency. Place the broccoli and sliced onions in a large bowl and toss with the sauce. Top with the salad with goji berries and pumpkin seeds. 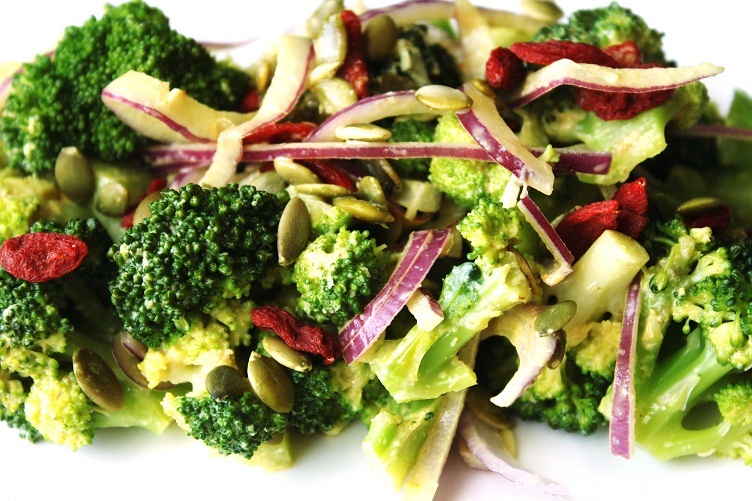 Serve creamy broccoli salad warm or chill before serving. That's all, as simple as making your favourite simple delicacy! Wow... I think this is something I can try! I am sure going to bookmark this page for when I would want to try it..